The Breuer is among the best examples of classic Bauhaus furniture and has been one of the most popular chair designs for more than fifty years. This timeless design is light, attractive and easy to repair when worn or damaged. The Breuer chair is the brainchild of the German designer Marcel Breuer. 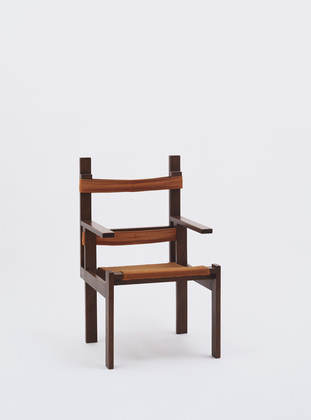 This steel club arm chair was of Breuer’s first projects and was completed in 1926. The chair is made from nickel-plated tubular steel. It proved immediately popular due to the fact it was very easy to assemble from ready made steel tubes and it was also incredibly light. 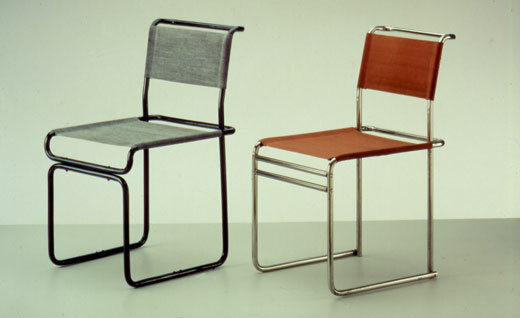 Due to the success of the Breuer chair, the designer established the Standard-Mobel company to manufacture it. While the design was revolutionary running the business proved to be more of a struggle. While his success as a businessman was mixed, Breuer would go on to find significant success as a designer in the United States. 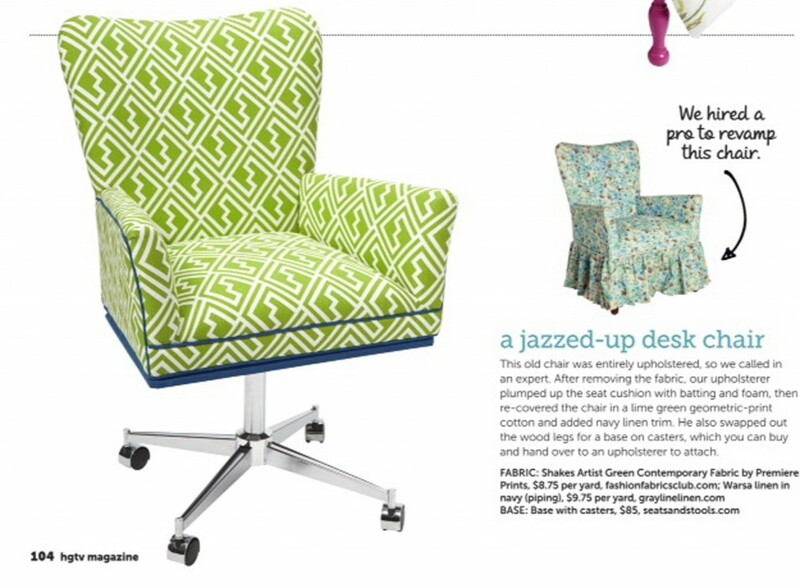 Along with the Breuer chair he is also famous for the MOMA chair. This innovative chair designed in 1949 was constructed from a single piece of plywood. Along with his work in furniture design Breuer also designed buildings. His Gellar house was called by the press “The house of the future.” Breuer is now widely recognized as one of the greatest design visionaries of the 21st century. While the Breuer chair is a fantastic design the backs and seats are prone to tears, holes and becoming worn. Thankfully replacing a worn out seat and back is relatively straight forward. The tubular steel design means that fitting a new back and seat is easy and requires few tools. If you follow the steps below you will find that you won’t need to purchase a new Breuer chair when your old one wears out. Before you can begin this project you will need a new replacement back and/or seat for your chair. 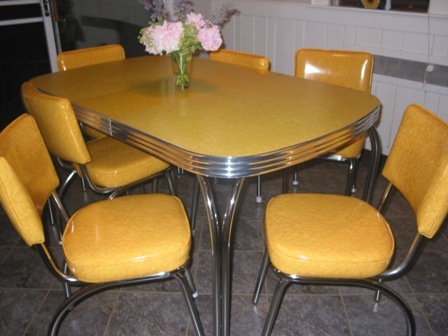 These can be found online or at a furniture store that stocks Breuer parts. Before purchasing a replacement chair or back make sure that they are the appropriate size for your current Breuer chair frame. Follow the step below carefully to replace your Breuer chair back and seat. Before beginning make sure to have all of your tools and replacement parts near by. It is best to performed this repair on a flat table top or bench. The first step is to replace the torn or worn out old back. For this you will require an electric drill fitted with a Phillips Head screw driver. If you don’t have access to an electric drill you can use a Phillips Head screwdriver to manually remove each of the screws. Remove each of the four screws which are holding the back of the Breuer chair in place. Once you have removed the screws place them to the side along with the back of the chair. Now that you have removed the old chair back it is time to mark the holes for the replacement back. It’s important that the new holes are positioned in the same place as the old holes. If the holes are in a different location they will not match the metal frame of the Breuer chair. To do this hold up the old chair back against the new one. It can be useful to place them on a flat surface such as a table top to make sure that they are positioned at the exact same height. Once you have them in position use the old holes as a guideline for marking the position of the holes on the new back. To confirm that they are in the correct position take a measuring tape and measure the distance between the two holes. The distance should be the same between the new back and the old back should be the same. If the distance is different you will need to remark the holes before proceeding. Next we are going to place the new back against the metal frame and screw in the top two screws of the Breuer chair. We want to make sure that the back of the chair is completely level. To do this, place the screws through the top hole of the metal frame and into the back of the Breuer chair. Tighten the screws slightly so that they hold the chair in place. If you have a builders level place this along the top of the chair back to make sure that the chair is level. Once it is level tighten the screws using the electric drill to hold it in place. Once you have replaced the chair back next we will move onto replacing the seat. Place the Breuer chair facing downwards on a table. The front of the chair should be resting on the table top with the back of the chair extending towards the floor. Next, use your electric screwdriver to loosen the screws holding the seat in place. Once the screws have been loosened so that they no longer extend into the chair remove them and place the old seat to the side. Now take the new seat and use the pilot holes on the seat as guide for the position for the screws. Tighten the screws into the new seat making sure that they are holding the seat firmly. Once you have finished screwing the chair, remove it from the table and place it back on the ground. Congratulations! 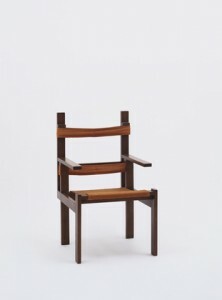 You have successfully replaced the seat and back of your Breuer chair. Test the chair to make sure that you can sit comfortably and that the screws are tightly held in place. You will now be able to enjoy your Breuer chair for many more years to come. Posted on June 24, 2013 September 15, 2015 Categories Breuer, Commercial Orders, ReplacementLeave a comment on We are Featured in HGTV Magazine! “I just want to let you know how much I appreciated the personal/professional service and advice you provided me. The Breuer Side Chairs and Counter Stools, upholstered with the Black Premier, are perfect…the height is perfect…the style is perfect…the quality is triple A…exactly what I wanted. New Chairs For A Urban High Rise Condo With A View! 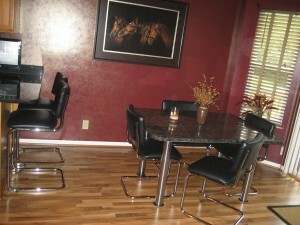 A choosy urban customer would’ve never imagined buying her dining chairs from an on-line site. But when she couldn’t find what she wanted in the shops a friend suggested Seats and Stools. We custom ordered a ladder chair to echo the airy feeling of the glass room in this high rise, a bronze finish to match the table, and cushions to pick up the color on the buffet. The result is quite luxe! 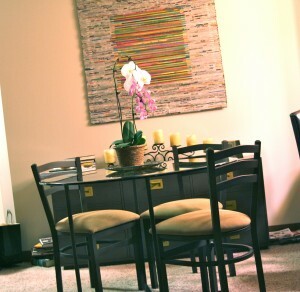 A beautiful dining room and a happy hard to please client! Posted on August 18, 2011 September 15, 2015 Categories Breuer, Commercial Orders, Replacement, RetroLeave a comment on New Chairs For A Urban High Rise Condo With A View! Growing up Molly had Breuer chairs at her breakfast table, she loved them so much now she has her own. 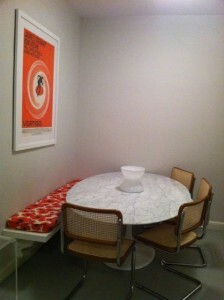 Molly has paired her new honey oak Breuer chairs with a modern marble top tulip table. When she sits at the table the chairs bring back wonderful memories from her youth, now she is creating her very own. 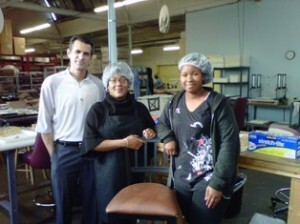 We were happy to donate stools to help the women of The Enterprising Kitchen a nonprofit social enterprise. With the addition of our stools they will be more comfortable as they work on manufacturing and packaging their line of wonderful Natural soaps and Spa products. Our Breuer chairs can be seen in the new block buster movie 2012. 2012 stars John Cusak, Woody Harelson and Danny Glover. The world may be coming to an end but our upholstered Breuer chair in black vinyl stands out. 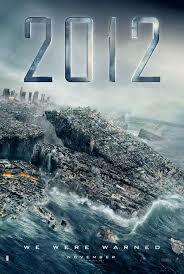 Do not miss this action thriller in theaters now. 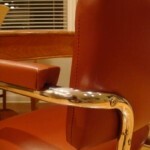 Keep you eyes peeled for the Breuer arm chairs. We do not want to give it away but you will find us at sea.